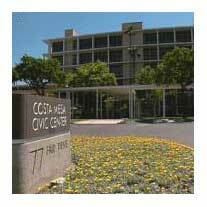 Next Tuesday, March 6th, beginning at 6:00 p.m. in council chambers at City Hall, the Costa Mesa City Council will hold what will likely be a watershed meeting in the history of the city. It will be at that meeting, near the very end if the schedule shown on the agenda, HERE, holds true, that they will consider whether or not to place Jim Righeimer's Charter scheme on the June 5th ballot. More on that a little later. As regular readers - and those of you that are sometimes irregular - know, it is virtually impossible to predict how long these meetings will run. This one looks to have earmarks for a long one, but we'll have to see how it goes. Regardless, your humble servant will be there observing and will report on the events later. WHERE'S THE JONES DAY BILL? After CEO Tom Hatch makes his report - we have no idea what he will cover Tuesday - the Consent Calendar will be considered. I perused both of the Warrants, #2409, HERE, and #2410, HERE, to see if we are finally going to see the January charges from high-powered law firm, Jones Day. Nope, can't find any reference to them. It's my understanding that their bill was finally received from contract City Attorney, Tom Duarte, at the end of this week, so the bill will be paid within a few days and probably show up on the warrants at the next council meeting on March 20th. The reason this is of concern is because Jones Day has been deposing employees for more than a month, with lots of $495 per hour lawyers in attendance, so the next few bills will probably be whoppers. You may recall that, during the last study session on February 27th, the staff announced their intention to request a budget adjustment of $900,000 for the Self Insurance Fund to cover these extraordinary expenses. We'll see in a couple weeks whether that is going to be enough. Other big items on the Consent Calendar include a more than $250,000 cost for the upgrade of our antiquated telephone system by Merrill & Associates, HERE; an approval of acceptance of $100,000 in measure M2 grant funds to provide catch basin screens, HERE; acceptance of nearly $69,000 of grant funds from the Urban Areas Security Initiative Grant Program to cover reimbursable public safety training costs, HERE and the resolution to appoint two members to the Oversight Board to supervise the activities of the Successor Agency to the Costa Mesa Redevelopment Agency, HERE. Mayor Gary Monahan has chosen himself and former RDA employee Dan Baker as the appointees. The only Public Hearing, a conditional use permit for a helipad on the roof of an existing industrial building near John Wayne Airport, will be continued to June 19th. Under Old Bu siness the only item scheduled to be considered is passage of two ordinances to facilitate the previously-agreed to new tier in the Miscellaneous Group employees contract of 2@60, HERE. New Business presents us with the most interesting, and potentially most time-consuming issues. First will be the resolution on the 2012 Orange County Marathon. 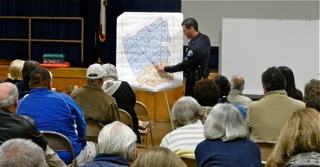 The staff report, HERE, includes the schedules of the various components of this event and the maps and charts indicating street closures on that date. Since this event is just around the corner - May 6th - and it looks like it is going to be a major inconvenience throughout many parts of the city, we all would do well to review the maps and closure schedules and adjust our activities for that day accordingly. The second item under New Business is the elephant in the room - Jim Righeimer's Charter scheme. You can read the staff report HERE. If the council decides to place this issue on the ballot, they will have launched the second-most important initiative in the City's history. In a nutshell - assuming the council decides to place this bogus charter on the June 5th ballot - they will consider five (5) separate resolutions. The first (a) proposes a measure for submission to the voters on whether the City should adopt Jim Righeimer's Charter. (b) calls for and gives notice of a special municipal election. (c) requests the Board of Supervisors to consolidate our Special Municipal Election with the Statewide Primary election on June 5th. (d) sets priorities for filing written argument(s) regarding a city measure and directs the City Attorney to prepare an impartial analysis. ( I'm sorry, but I almost choked when I read that last part.) (e) provides for the filing of rebuttal arguments. I suspect there may be a few people who will attempt to talk the four members of the council out of this bogus scheme. I expect Wendy Leece will vote against it. Of course, the council will listen, but not hear, those views and will certainly vote to place it on the ballot. And then the fun will begin. The groups around the community that have been meeting regularly to discuss Jim Righeimer's Charter will likely spring into action immediately in an effort to defeat this hastily-contrived and politically-opportunistic attempt to completely take over the City of Costa Mesa. It's going to be a very interesting spring. The final scheduled item on the agenda, New Business #3 - added at the last minute late Friday afternoon - is Steve Mensinger's brainstorm to create annual performance audits, HERE. As you read through the staff report you'll see that there may be $50,000 budgeted in the next fiscal year for this plan - maybe more. My suggestion would be to wait on this issue to see what is left of the City Staff following the outcome of the OCEA lawsuit, THEN create a mechanism for these kinds of evaluations. The staff has plenty on it's plate right now without another brainstorm hatched (sorry, Tom) by a guy with too much time on his hands. As always, the very end of the meeting may produce the most excitement. That's when the council members spring new initiatives on us during their "comments" segment. After all is said and done, I'm thinking this meeting will finally wrap up at 11:56 p.m. Keep your fingers crossed. I'm taking a pillow with me this time. 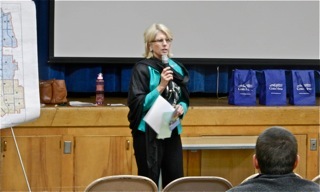 Wednesday evening Costa Mesa councilwoman Wendy Leece hosted another in her series of public safety Town Halls, this time at College Park Elementary School. 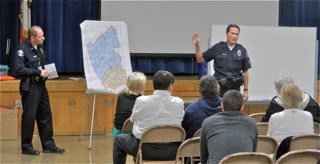 This successful event found 50 College Park residents gathered to hear from Leece, members of the Costa Mesa Police Department and community volunteers from emergency response and neighborhood awareness organizations. Leece kicked things off, then handed the baton to 28-year veteran CMPD Lieutenant Bob Ciszek, Area Commander of Area 2 - the administrative sub-division in which the College Park community is located. He spoke about Community Oriented Policing, partnership between the police and community and community events such as C3 (Cops, Church, Community), National Night Out and Neighbors to Neighbors - all events designed to tighten the bond between the community and the police officers who provide for their safety. Ciszek spoke of the types of crimes they're seeing in our city, focusing on "crimes of opportunity" - unlocked cars, open garage doors, etc., and stressed that residents shouldn't have things in plain sight in their cars. He also spoke of the "Broken Window" concept, where a home that looks unmaintained may be a more likely target for burglaries than others. He talked briefly about the recently-implemented "hybrid" scheduling, which combines 4/10 and 3/12 shifts to provide coverage in the city now dealing with 30 fewer sworn officers than just two years ago. At one point he said, "We're working as hard as we can to keep you as safe as we can." Corporal Doug Johnson, 19 years on the CMPD, then discussed issues like the Neighborhood Watch program and the Citizen's Police Academy and gave an overview of how the city is broken up into sub-areas within the two major reporting areas. He gave a breakdown of major crimes for the past 12 months in the areas that form the College Park community, then compared those numbers to areas within the Westside of the city that have three times the number of calls for service - an eye-opener for the audience. Johnson also spoke briefly about how the CMPD deploys its resources now with fewer officers. He mentioned that some of the specialty units - the Narcotics unit, for example - have been disbanded and those officers folded back into other operations, and that the Gang Unit has been reduced from 6 to 4 members. He also spoke of the delays in service responses on busy nights - Fridays, in particular. He also addressed solicitors and scavengers. Residents should call the CMPD if they're concerned about solicitors in their neighborhoods because most do not have permits. Scavengers are not permitted in the city, so residents should call when they see them. Traffic Bureau Sergeant Greg Scott - a 20-year veteran - then spoke to the group. He compared his motorcycle officers to police helicopters in that they are "force multipliers" - because of their quickness they can cover more ground. He spoke of the CMPD DUI team, each member of which is award-winning for their performance taking drunk drivers off the streets. He referred to one member of the team who will receive an award from Mothers Against Drunk Driving (MADD) for apprehending more than 430 drunk drivers last year and mentioned that all the other members of the DUI team will be members of the coveted "Century Club" - those who apprehend 100 or more drunk drivers. 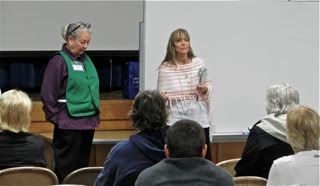 Cindy Brenneman and Diane Swarts of the Community Emergency Response Team (CERT), HERE, briefly gave an overview of their organization and encouraged residents to sign up for the next class in April. Diane Hill who, with her husband Paul, runs United Neighbors, HERE, also spoke briefly, introducing her organization and encouraging College Park residents to sign up for her email alerts and consider forming neighborhood groups to facilitate responses in the event of major emergencies. The meeting, scheduled for 90 minutes, stretched to nearly two hours because of the excellent presentations by the CMPD and the enthusiastic participation by residents, who asked many relevant questions. All in all, this was yet another excellent community outreach by Leece and the CMPD, with more to come. I just hope they'll advertise the next one a little more and get an even larger response from the neighborhood. This afternoon Joe Serna, writing in the Daily Pilot, has an excellent piece describing Costa Mesa's first pass at considering shifting from a General Law city to a Charter city - way, way, way back in 1971. You can read Serna's article HERE. 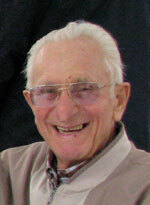 In his piece Serna quotes some of the very senior citizens who were involved in this process, including former City Manager Fred Sorsabal - the man who hired and trained recently-retired City Manager, Allan Roeder - and long-time Costa Mesa resident and educator, Hank Panian. The Pilot is also running a letter Panian wrote to them back in January about this first effort, HERE. In case you're wondering why we should care about what Hank Panian thinks on this issue, you can read more about him HERE, in a piece published by Orange Coast College a few years ago, and HERE, in a piece Daily Pilot columnist Jim Carnett wrote about him a little over a year ago. He's a man who has spent virtually all his adult life as an educator and community activist in Costa Mesa trying to make this town a better place to live. What I take away from this article and Panian's letter is that this process should not be done in haste. It requires more careful deliberation than it's being given right now. The ONLY reason to rush this process is because it suits Jim Righeimer's agenda - fewer voters vote in the Primary Elections and, since only the Republican Presidential ticket will be contested in June, he has a much better chance of a voter pool that leans toward his way of thinking. The views of these highly respected men should carry some weight with the voters of this community. Jim Righeimer's hasty, politically-opportunistic Charter should be rejected in June. In what turns out to be the best kept secret in town this week, I just learned that Costa Mesa City Councilwoman Wendy Leece is holding another in her series of Town Hall meetings tonight! This meeting is geared to issues within the College Park neighborhood. As was the case in her meeting at Pomona School, the focus will be public safety. Members of the CMPD will be present to discuss traffic and other public safety-related topics. The CERT team will also be present to discuss that valuable program. The meeting will be held at College Park Elementary School, 2380 Notre Dame Road and is scheduled to run from 7:00 - 8:30 p.m. 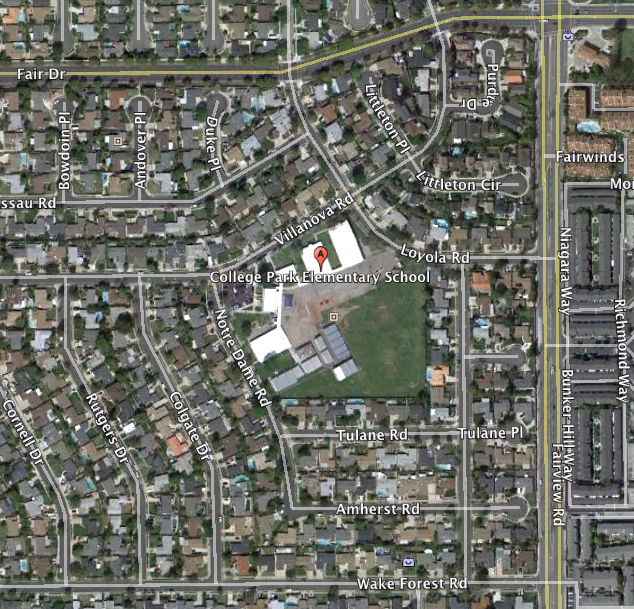 I've provided you with a map of that location, below. I plan to attend and hear what concerns our College Park neighbors have about safety in their neighborhood - and other issues, too. See you there. 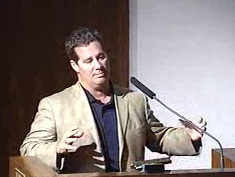 Early or late, almost any meeting of the Costa Mesa City Council these days proves to be entertaining. The Special Study Session held in council chambers beginning at 4:30 ended precisely at 7:00 and was, indeed, entertaining. It was also very frustrating at times. First, Eric Bever failed to show up. I guess, in his words, he "didn't sign up for this". Then Mayor Gary Monahan bailed out at 6:00 p.m. for some more important engagement following the first segment, the Homeless Task Force report, leaving barely a quorum. Then, a half hour later, the sometimes very obtuse Steve Mensinger - perhaps influenced by the recent visit of our Australian exchange students - went on a walkabout. He just got up and wandered out of the auditorium without saying a word, leaving Finance and Information Technology Director Bobby Young frozen in the middle of a word because Mensinger's absence eliminated the quorum. Mayor Pro Tem Jim Righeimer called for a short break, leaving those of us left in the audience to chuckle among ourselves. "Clueless" was among the words that popped into my mind. The meeting re-convened five minutes later after Mensinger returned from making his telephone call or his bathroom break - whatever took him out of the room. Hmmm... I guess the world REALLY does revolve around him, after all. 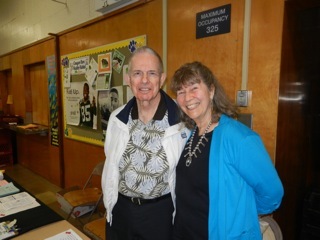 The report of by th e Homeless Task Force, led by Jeff Mathews and Muriel Ullman, was crisp and excellent. You can read the staff report HERE and the 137 page foundational document HERE. I won't try to re-hash the entire presentation, but will observe that much progress has been made in the year since this Task Force was constituted. Goal have been established and plans to reach them have been formulated. Many new ordinances would have to be created to cover some of those steps. However, while the council members in attendance were grateful for all the hard work put in by the members and their leadership, one had the impression that they were not fully on-board with some of the things that needed to be accomplished. Perhaps that might have had to do with the lingering problem - after the homeless folks in our city have been sorted out and those who fit the definition created by the task force as "Costa Mesa Homeless" - those for whom support services will be provided - what happens to the remaining homeless people who don't fit the definition, but remain "homeless in Costa Mesa"? There were no good answers to that question, but bus tickets out of town were seriously mentioned. CEO Tom Hatch also expressed s ome concern that, in the process of implementing the plans, we might might end up only making things worse. The services that would be made available might attract even more homeless folks to our city. It was acknowledged that the weather, proximity to the ocean and services already in place ARE, to use a Mensingerism, "attractants". I agree with that apprehension. It seems entirely logical that if you create even more services and an infrastructure to manage this issue more homeless folks will descend upon our city. This, I fear, is going to be the crack in the foundation of this program that simply must be solved FIRST. Mensinger, during the discussion of the homeless problem, said one of the strangest thi ngs - of many - that I've ever heard him say. He said, "... I really don't think it should be the responsibility of our police department to go solve problems on private property - that's a function of the property owners." You could hear jaws dropping all over the auditorium! I wonder just what his definition of "public safety" actually is? His vision is, apparently, a hoard of private security officers hired by property owners to protect their individual investments. He went on to complain about having to "walk two miles" during a recent police department ride-along, looking for homeless people around businesses. Bobby Young provided a fairly positive report on our Mid-year financial performance. You can read his staff report HERE. He told us that he is cautiously optimistic about the Sales Tax revenues that seem to be bouncing back from the dreary fiscal years of 08/09 and 09/10. The quarter that included last Christmas was up nearly 12% from the same period the previous year. He's pr ojecting "only" just over 5% for the final two quarters of this year - an acknowledged conservative approach, but safe. The Transient Occupancy Tax (TOT) is also trending upward on a similar track as the Sales Tax revenues are showing. He is projecting just over 2% increase for the final two quarters - again, a very conservative number. He didn't provide an analysis of Property Tax revenues because it seems to be flat and consistent with the budgeted numbers. Young will be recommending revenue adjustments netting just over $340,000, with five areas adjusted upward and two down. Increases will be recommended for the TOT ($250,000); Cable TV Franchise Fee ($100,000); Solid Waste Hauler Franchise Fees ($250,000); Paramedic Fees - Advanced ($50,000) and Other Miscellaneous Revenues ($41,225). 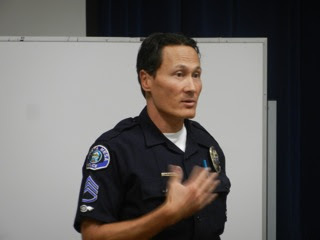 The two downward adjustments, Vehicle Code Violations (-$200,000) and Parking Citations (-$150,000), are directly related to the staff reductions in the Costa Mesa Police Department. 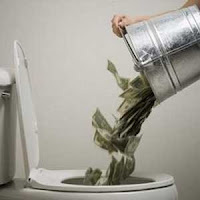 When the budget was approved last June there was a $970,000 "contingency fund" created from which CEO Hatch could pluck handfuls of dollars for un-budgeted items as they occurred. After a short discussion about one significant item that appeared to be mis-applied to this account, it looks like the City has spent a little more than half of this amount - $545,273 - in the first half of the fiscal year. The problem here is that it is the policies of this council that caused this overtime to be work ed! They've refused to let the Fire Department hire any new employees unless they agree to re-open their contract and accept a second tier for their retirement. So, in order to provide for public safety, firefighters and their commanders MUST work overtime to cover the shifts. In the case of the Police Department, Righeimer conveniently ignores that fact that they've refused to allow proper staffing, limiting it to 131 sworn officers (including 5 paid for with grant funding for 5 years) when all credible sources that they've contracted with for their expertise tells us that there should be AT LEAST another dozen officers for MINIMUM staffing. He also conveniently ignored that much of the overtime they show on their compensation report is money reimbursed to the city by events like the Orange County Fair, the Barrett-Jackson auction, etc. Nah, they won't talk about that because it doesn't fit their personal agenda. Instead, Righeimer portrays the public safety staff as a bunch of selfish, greedy laggards, interested only in retiring. The area of greatest concern to me - and a few members in the audience - was th e planned request to nearly double the amount in the Self Insurance Fund, from $932,008 to $1,832,008. This fund is where dollars are plucked from to pay litigation expenses. As most know, we've been blowing through that fund like proverbial drunken sailors now that the pricey law firm, Jones Day, is on board trying to quash the lawsuit filed by the employees to stop the outsourcing scheme. WHERE'S JONES DAY JANUARY BILL? Wendy Leece wondered where the January numbers were for Jones Day, since it seems their charges for January don't show up anywhere. Contract City Attorney Tom Duarte told her that he had the bills for review and approval and that they would be processed for payment shortly. You can read the legal bills paid so far this year HERE. The requests for budget adjustments will be presented to the council for action at the second meeting in March, according to Young. As an aside, I finally got a copy of the 5-year Forecast spreadsheet that was the result of the exercise a few weeks ago when Righeimer and others simply plucked numbers out of the air instead of doing any kind of even rudimentary analysis and plugged those fabrications in five years out. The way things work with these guys, those numbers will soon be cast in concrete and be the working "bible" for all municipal financial activities even though a chimpanzee could have come up with something just as valid. That form is NOT available online yet, but I'll give you the link when it is. IT'S GOING TO BE A BLOODBATH! Maybe, if you're a marginally skilled developer, you can get away with that kind of capricious fiscal management because, theoretically, you can just raise your prices if you have a shortfall. In municipal fiscal management, where a balanced budget is critical, your options are limited and usually involve cutting costs. "Costs" means people because that's where the bulk of the dollar are spent. I guarantee you that, if this crew stays on the council and based on what they've conjured up for the next five years, Righeimer's outsourcing scheme is only the beginning. It's going to be a bloodbath! 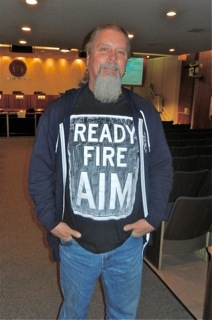 The T-shirt Billy Folsom wore to the council meeting last week for the recognition of his 30 years with the city was right on the money. It read, "Ready, Fire, Aim" - an acknowledgment of the way these guys operate. It's a heck of a way to run a city. 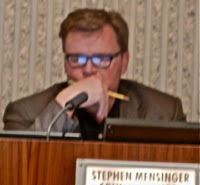 The short version of what happened at the Costa Mesa Sanitary District Special Meeting this morning is... after approximately 30 minutes of deliberation in a Closed Session, the Board - back in open session - voted 3-2 to move forward and request the law firm of Meyers Nave to proceed with what is called a quo warrento proceeding. They will forward a request to State Attorney General Kamala Harris immediately for her opinion. If she concurs, legal action will be initiated to remove Director Jim Fitzpatrick from his seat on the Sanitary District Board. Fitzpatrick and Board President Bob Ooten voted against the motion. I tried to reach Ooten for a comment but he's not responded by the time I needed to publish this entry. I may post an amendment to this entry with his response later. I had also hoped to be able to link to Joe Serna's Daily Pilot article because he WAS there, but it's not ready at press time. I'll link to it later, so check back this evening. In the meantime, you can read his preamble coverage HERE. *11:00 p.m. You can read Joe Serna's excellent piece covering the meeting HERE. The accompanying photo by Scott Smeltzer shows Fitzy looking like he needs a Tums. All this turmoil was created when Fitzpatrick ignored the original advice by District Counsel Alan Burns that holding seats on both the Sanitary District Board and the Costa Mesa Planning Commission simultaneously was incompatible as defined by state law. According to reports from the scene, only two people rose to speak to this issue in the Public Comments segment before the closed session. One was a representative of a waste hauler, who didn't speak for Fitzpatrick, he spoke in favor of open bidding for the trash hauling contract. The remaining person who spoke was Costa Mesa Parks and Recreation Commissioner and Jim Righeimer sycophant Ethan Temianka. According to those at the meeting, Temianka presented views straight from Fitzpatrick's playbook - his email blast sent to "friends" yesterday encouraging support. Temianka recently announced that he will challenge Trudy Ohlig Hall for her seat on the Mesa Consolidated Water District Board next fall - another tenticle on the OC GOP takeover of the Newport-Mesa area. Incidentally, sources tell me that approximately a dozen emails were received since Fitzpatrick's frantic appeal yesterday and most of those were supporting his position. I've not seen them so can't give you any idea of the breakdown or the specifics of what they said. I know they were NOT unanimous supporting Fitzpatrick because they included my message. Considering the intensity of his appeal, this seems like pretty weak support to me. Because the meeting took nearly three hours, and because Fitzpatrick makes long-winded pontifications on almost every issue that is discussed, the Sanitary District Board did not complete their agenda. Some words used to describe his behavior at the meeting were: Egotistical; Self-centered; Know-it-all; Condescending and Bully. So, many of the more interesting issues - like a review of committee assignments - will occur at the regular meeting in March. Assuming that Fitzpatrick is still on the Board at that time, expect more fireworks at that one. Now we wait for a response from the Attorney General and begin to watch t he legal fees tally up until this issue is resolved. It is estimated that it could cost around $50,000. It could be easily resolved if Fitzpatrick chooses to resign from either of the "incompatible" seats he holds. Based on his reaction to this situation, few think that will happen. He will probably let this legal challenge play out - forcing the Sanitary District to pay legal costs to move forward - to the point where he must, personally, begin paying legal bills. 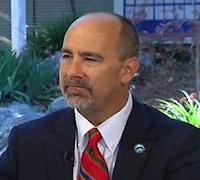 Costa Mesa Sanitary District Director Jim Fitzpatrick - who also holds a seat on the Costa Mesa Planning Commission - apparently is in a major panic about the possibility of losing his seat on the Sanitary District Board. Today he fired off an email blast to who-knows-how-many friends and acquaintances, begging for their intervention in this matter. He asked them to attend the meeting to speak in his support and to send notes of support to Sanitary District General Manager Scott Carroll. His correspondence is a disjointed, inaccurate call for action and attempts to deflect the fact that two legal opinions have determined that there is "incompatibility" between the two seats he currently holds by attempting to make it seem that the majority on the Sanitary District Board are trying to dump him because he disagrees with opinions about contracts. He also misstates the situation that existed with Mayor Gary Monahan. He says in his frenetic rant that Monahan held a position on the City Council AND the Sanitary District Board simultaneously for four (4) years. That's not true. Monahan was termed out of his council seat, so ran for a seat on the Sanitary District Board and won. Two years later, once he was again eligible to run for City Council, he ran and won a seat and then held both seats simultaneously for two (2) years. However, it is completely irrelevant, since the legal opinions the Board has in front of them clearly spell out that different rules apply to council positions than planning commissions. Fitzpatrick also included an attachment to his email - a confusing array of slides that look like they might have been done in a junior high school class - that perpetuate the falsehoods of his correspondence and his attempts to deflect the issue from him to others. Among those images is a copy of comments made on the recent Daily Pilot article about this issue by fellow planning commissioner, Rob Dickson, who makes his living as a paralegal for a big local law firm. Now, Dickson is a nice guy and pretty smart, but he's NOT a lawyer, so his opinion should be taken in the proper context. Clearly, Fitzpatrick is in a panic and is flailing around like a guy in quicksand. Sadly, the more he flails, the deeper he sinks. Today, after reading Fitzpatrick's diatribe, I did as he suggested to his friends. I wrote to Scott Carroll, scarroll@cmsdca.gov, and suggested to him that the Sanitary District Board review all the facts and legal opinions available to them and any precedents that might apply as they deliberate on this issue in their Closed Session tomorrow. I suggested that, if they determine that Fitzpatrick holds two positions that are "incompatible", they should ask him to resign. If he refuses and chooses, instead, to force the Board to take legal action to remove him, then that decision is on HIM, not the Board. Based on the facts of the issue available to me, including a review of the report from the law firm they hired to analyze and report on this situation, it is clear that Fitzpatrick's positions are "incompatible", and he should step down from his Sanitary District Seat. I don't plan to attend the Sanitary District Board meeting tomorrow. The confine s are just too cozy for me and there's no telling how long they will be in Closed Session. However, once they finish that part of their agenda they will report out the result and move on to the remainder of their Open Session agenda, HERE. It might be fun to be a mouse in the corner in the Sanitary District Conference Room tomorrow, don't you think?